Will TomoClases.com steer Chile’s Universities to a Tech Savy Future? Trick Question (it’s Halloween season folks) — Name two people receiving more Chilean press than a Miner Survivor preparing to enter the Presidential Race? Answer: Meet the dynamic entrepreneurial duo, Guimar ‘Vaca’ Sittic and his CTO sidekick Eric Denovitzer, the latest Chilean startup all stars hoping to lead their country’s – and in time all of Latin America’s – entire education industry to embracing the 21st century. So when/where and how exactly did these head honchos brainstorm such a progressive concept (seemingly overnight) that in the last six months they’ve recently joined Argentina’s top idea incubator NXTPLabs.com and began site expansion to the Argentina, Brazil, and Colombian markets? For starters, they’re both alumni to notable US Universities – the University of Chicago and Princeton respectively. Then combine this top-tier higher education experience with a multi-lingual/international business sense and it results in producing two civic-minded leaders perfectly ready to embrace the challenging landscape, when it comes to designing an online learning community that will change all future generations. Vaca Sittic’s previous stint, helping cofound/sell restaurant booking website CenaPlus which raised $3.2 million in funding by February 2011, also gives the team an advantageous, competitive edge. To quote an old Texas adage, this is not the boys’ first rodeo. In describing the company’s site premise and overall purpose, TheNextWeb.com’s reporter Anna Heim highlights how TomoClases.com takes the “offline classes and workshops marketplace model,” that’s comparable to the already popular domains like Khan Academy or SkillShare – but will concentrate their ambition more to specifically improving Latin America education. Understanding certain, culturally relevant elements also matters a great deal when analyzing how the site will provide sustainable content long term. Completing such thorough, primary, in-depth due diligence understandably generates ample, invaluable rewards. 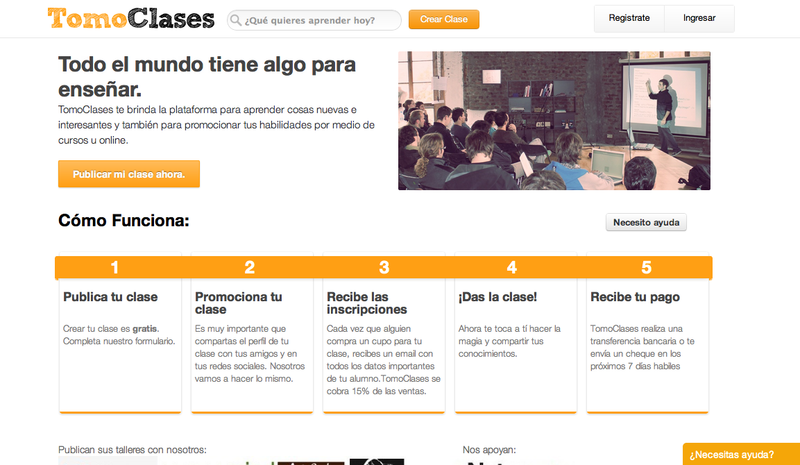 It’s exciting to watch where TomoClases.com will go next, especially considering that even since last April’s beta launch when they first introduced the site to only the Chile/Mexico markets, the community now shares 600+ online classes to a 1,250+ user database. So just how far will this online mercado, that openly shares an interactive knowledge source to one of the world’s fast-growing regions go? Well if the developing team keeps up their current work, it’s likely that TomoClases.com will evolve far beyond the founders’ initial vision and aspirations. It’s interesting, that where so many online platforms fail to maintain a strong, online brand community presence, TomoClases.com’s Blog, Twitter, and Facebook channels all display enriching, supplemental content. It’s a smart strategy that will only help the founders as they plan to court students, professors, and select education leaders’ participation more aggressively. Anyone who still stands with both their initial entrepreneurial project and body intact despite enduring numerous, relentlessly searing VC investor screenings certainly posses a natural ability to demonstrate creative, charismatic leadership. But it’s also arguable that certain things succeed because on only the most select occasion, Lady Luck will opt to shine favor toward endeavors she deems worthy. TomoClases.com’s serendipitous, timely beginning hit the web not long after several reports announced that Latin America’s current informal education market, a sector where 18 million users already spend $5+ Billion USD annually- was growing by 16% every year. Indeed, this proves point to international journalist Henry Golden’s now legendary business philosophy, “The only thing that overcomes hard luck is hard work.” As TomoClases.com continues to circulate their initiative worldwide, hopefully this winning streak will keep pace. It’s almost hard to believe that in just a few short week, students everywhere will rejoice to celebrate another semester’s end, yet the duo will not spend the remainder of 2012 enjoying a leisurely holiday season. Far from it in fact, as they’ve expressed that their next major milestone will mean securing 10,000 classes and expanding the user-audience by at least ten-fold. However while the weary TomoClases.com team soldiers on, a hard working holiday now will hopefully mean magnitudes of vacation time to themselves later, after they’ve managed to successfully create one of Latin America’s most lucrative, extraordinary businesses.